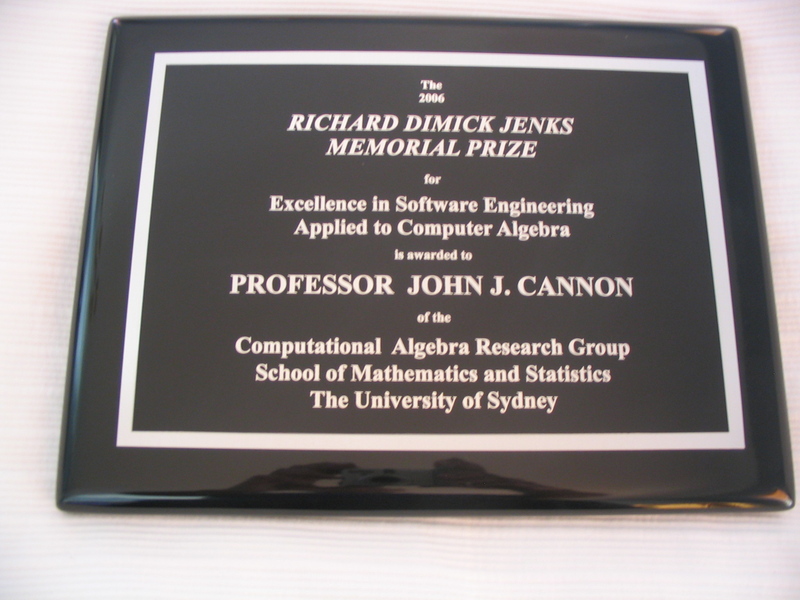 Prof. John J. Cannon of the School of Mathematics and Statistics of The University of Sydney has been awarded the 2006 Richard Dimick Jenks Prize for Excellence in Software Engineering Applied to Computer Algebra. Prof. Cannon is the head of the Computational Algebra Research Group at The University. The award recognizes the outstanding work of Prof. Cannon and his research group on the design and implementation of the mathematical computation system Magma and for Cannon's earlier work on the computer algebra system Cayley. A check for US$1,000 and the above plaque was presented by Dr. Barry Trager at the 2006 ISSAC Symposium in Genova, Italy, on July 11 2006. Dr. Wieb Bosma, one of Prof. Cannon's principle collaborators on Magma, accepted the prize on behalf of Prof. Cannon. From The Australian Mathematical Society Gazette, September 2006.